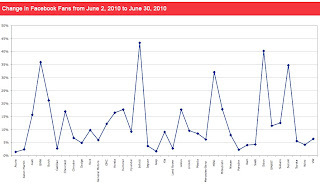 Well after a fairly mild, ho-hum couple months life is heating up on the automotive brand fan pages with several companies upping their marketing on the site and a lot of double digital month-over-month growth from several brands in June. 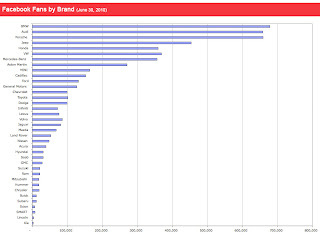 The big battle of fans was last month’s BMW vs. Audi battle royal. It seems both brands answered the challenge by working hard to get new fans. 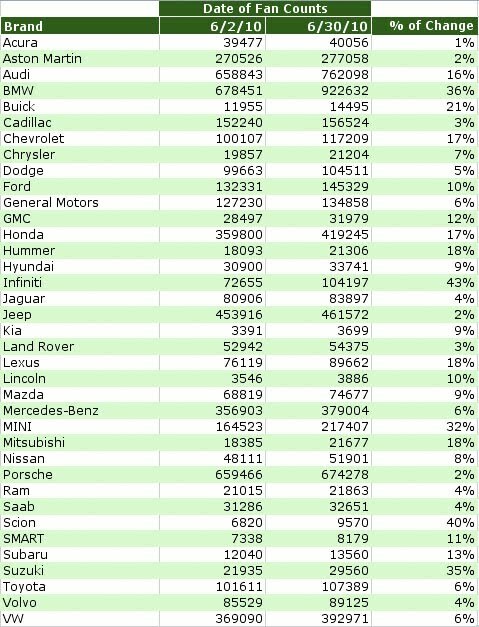 BMW had a staggering 36% increase in fans which is an insane growth percentage from a brand with already the highest numbers of major automotive fans on the social media site. They added 244,181 fans in one month! 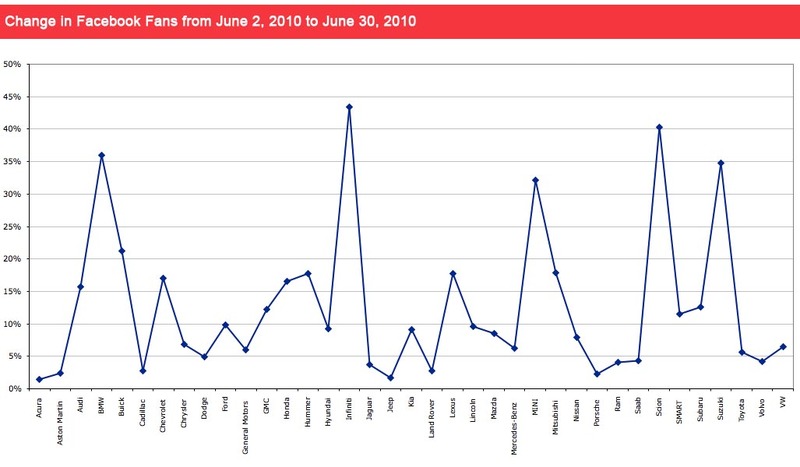 Audi did very well too with a 16% growth rate and 103,255 fans added in June. 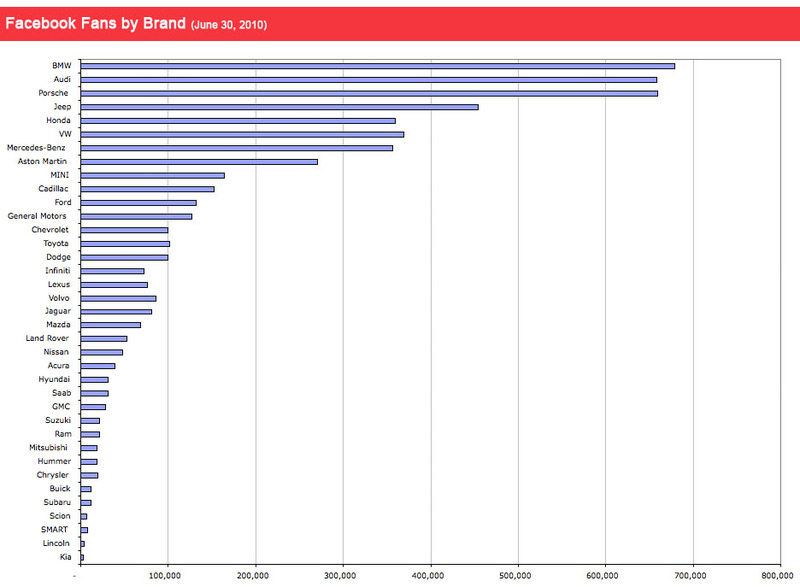 That’s almost the total amount of Toyota Facebook fans; 107,389 fans to be exact. 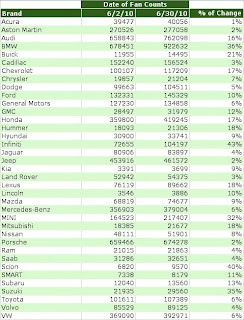 I’m still trying to figure out what BMW and Audi did to drive so many “Likes” in one month. My guess is outreach to owners through Become a Fan messaging and some social media marketing on Facebook, but I can’t confirm either. Toyota did a lot of marketing on Facebook this month, but they didn’t do it to drive people to the Toyota fan page; instead, they took users to their Toyota Safety landing page where they are working on their safety perception issue after many recalls. Lexus had its own Facebook goals where they drove consumers to their Facebook fan page by enticing them with the new halo vehicle advertisement for the new LFA super car. 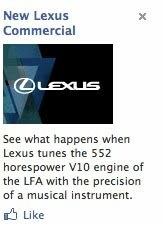 The message must be getting through as my own father in-law, not a car guy at all, started asking me about the LFA one day on a Home Depot run; though, he saw the ad on television. Mini and Infinti both had big jumps in fans with 32% and 43% gains respectively. 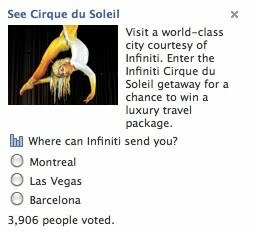 Infiniti ran a campaign promoting their Cirque du Soleil contest that brought users to a Facebook tab promoting the contest. Meanwhile, Mini had its fun challenging Porsche to a race. The Mini vs. Porsche effort definitely spawned some major engagement with its fans that mostly loved the idea of challenging the all mighty Porsche 911. It certainly was a crazy June on Facebook. I’m curious what July will bring. UPDATE: Thanks to one of my new Twitter followers @ChrisBrashear it seems Audi ran a photo upload contest in June which I'm sure was supported with some ad dollars on the site too.